Who Doesn’t Like Chocolate Cake? Who doesn’t like chocolate cake? (well there are a few). 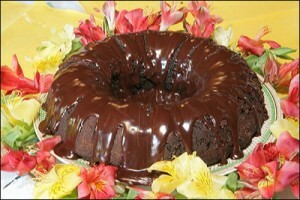 I’ve got this great chocolate cake recipe I’ve used for all sorts of events. The original recipe, one that I have modified some over the years, came from the “Passionate Vegetarian,” a great vegetarian cookbook by, yes, Crescent Dragonwagon. (I don’t know her history, I think she’s in northern California, but I doubt there was a Mr. and Mrs. Dragonwagon announcing the birth of their daughter, Crescent. Could be wrong….) Anyway, it’s a great cookbook. Anyone interested in beautiful, creative, delicious vegetable recipes should take a look at it. The chocolate cake is called “Dr. Feelgoods Chocolate Cake.” Crescent says that it’s also known in some cookbooks as Wacky Cake because it’s ingredients are wacky and have no business being so good together. It’s true. No eggs, no butter in it but you’d never know it. This cake is delicious and practically foolproof. And it’s a vegan recipe! I’ll give you my slightly modified recipe at the end of this little discourse on….sugar. This recipe calls for 2 cups sugar and you need it to offset the …vinegar. The cake is not overly sweet. You can use any kind of granulated sugar maybe even Splenda but I’ve never tried that. I’ve used white sugar, raw sugar, organic raw sugar etc. I almost always use raw and organic sugars now. Sugar refining is not kind to the environment or the people who work the fields….Thinking that using raw and organic sugars was the ultimate choice, I was surprised one day to find in Whole Foods, VEGAN raw sugar. What???? I just assumed that sugar was vegan because it’s made from sugar cane or beets. It turns out that half of the sugar refineries in the US use something called bone char to filter the sugar and take out any color left in the sugar. The bone char used in this filtering process is so far removed from its animal source that cane sugar processed in this method is deemed kosher pareve, which, according to Jewish dietary laws, means that it contains no meat or milk in any form as an ingredient. A number of vegans disagree with this perspective. Many vegans prefer to avoid white table sugar altogether rather than chance using a product that was filtered through bone char. Bone char, also known as bone black, ivory black or animal charcoal is a granular material produced by charring animal bones. To prevent the spread of mad-cow disease, the skull and spine are never used. The bones are heated to high temperatures—in the range of 400 to 500 °C (752 to 932 °F)— in an oxygen-depleted atmosphere to control the quality of the product. There are many reasons to avoid table sugar as many of us are now aware and knowing about bone char may be an effective aversion therapy. There are many other, arguably healthier sweeteners but most of them have a distinct flavor all their own that has to be taken into account in whatever you’re making. And of course liquid sweeteners require real finesse when substituting one of them in a recipe. For a wonderful dessert cookbook using other sweeteners try, “Love, Eric,” a book of macrobiotic vegan desserts by chef Eric Lechasseur. It was a gift to his wife, to satisfy her sweet tooth, as she recovered from cancer. But back to my chocolate cake: you can’t beat it for any occasion using a granulated sugar of your choice. A Delicious Chocolate Cake that is vegetarian, vegan. I added more cocoa than the original recipe because I love chocolate. ¼ tsp. fiore di sicilia (opt. but it is a DIVINE flavoring. Available at King Arthurs Flour on line. Whisk the dry ingredients into a large mixing bowl. Combine all wet ingredients in large measuring cup or bowl. Pour wet into dry and mix. Until most of the lumps are gone. Bake in pan or pans of choice (I like a bundt pan, see picture) in 350 degree oven until toothpick in center comes out clean. Bundt takes almost an hour, regular cake pans closer to 30 minutes. For a great glaze, melt 4 oz of bittersweet chocolate in microwave. Heat about ½ cup of heavy whipping cream almost to boil. Whisk cream into chocolate a little at a time until you have a smooth glaze just thick enough to pour over cake. Let it thicken on cake a little and then add some sprinkles of course ground sea salt because yes, sea salt and chocolate are really good together….. Copyright © 2012 Lara's Favorite Things. All rights reserved.